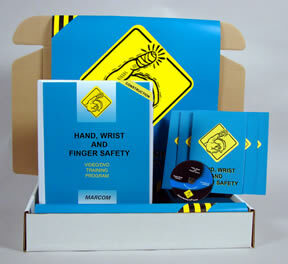 Hand, Wrist and Finger Safety in Construction Environments Construction Safety Kit reviews hand, wrist and finger hazards and helps employees to take the steps necessary to avoid them. Each year over 500,000 people injure their hands, wrists or fingers. Nearly one out of four on-the-job accidents involve these parts of the body. To help reduce these problems it is important for employees to learn about the most common hazards to these areas of the body. Materials in the kit include a DVD program, five motivational posters, and 30 employee booklets. The posters in the kit remind employees to work safely and avoid injuries. The DVD program and employee booklets include information on physiology of the hand, wrist and fingers, identification of common hazards, proper work procedures, tool use and maintenance, using personal protective equipment, injuries and first aid, and more. The DVD program in the kit comes with a comprehensive leader's guide, reproducible scheduling & attendance form, employee quiz, training certificate and training log.